This versatile multi-use folding shovel is manufactured using tubular steel with a heat treated carbon steel blade making it light-weight yet strong and durable. The blade folds compactly for easy storage and can be used locked in three positions for use as a shovel, pick or trench. It is ideal for digging, levelling ground, removing rubble, grubbing or scraping with its serrated edge. It is also popular with builders when laying drainage pipes as this shovel is ideal for moving and levelling the shingle that these bed down on. As it is so compact, this is also popular for leisure activities such as metal detecting, and will be the most robust sand castle shovel on the beach! 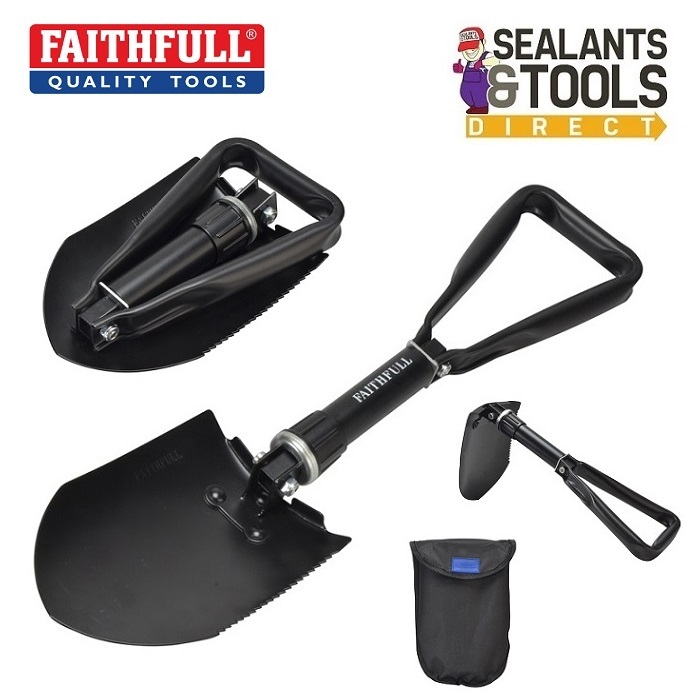 Demonstration Video of this Impressive Folding Utility Spade from Faithfull. Unfolds from 230mm 9 inch to 570mm 22½ inch. Heat treated carbon steel blade lightweight yet strong and durable. Ideal for digging, levelling ground, removing rubble, grubbing or scraping. The handy vinyl storage with Velcro backed belt loop. Compact size ideal for use in all types of vehicle. Camping, Fishing and other leasure activitys. It can be easily stored in the car for those winter emergencies, where the point and serrated edge will help deal with ice as well as snow. The shovel unfolds to 570mm and folds up to and extremely compact 230mm which is less than the length of a standard ruler. Supplied with a storage bag with a belt loop that is Velco backed to help prevent movement when stored in the boot of a car. Can be used in three positions, Shovel, Pick or Trench.